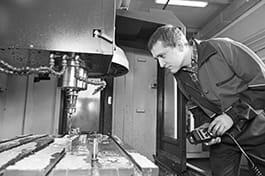 The lathe or turning machine tool setter-operators set up, operate or tend lathes and turning machines to turn, bore, thread, form or face metal materials. Read and interpret technical documentation. Plan and set up (the sequence of) operations according to written specifications, tooling or other instructions. Determine and select materials according to job requirements. Start the lathe or turning machine. Monitor the machinery during its operation, e.g. to ensure specifications are met and to detect faults and defects. Adjust machine controls and change tool settings if necessary, e.g. in order to keep dimensions within specified tolerances. Inspect sample workpieces to verify conformity to specifications using instruments such as gauges, micrometers, dial indicators, etc. Lift metal stock or workpieces manually or using hoists, and position and secure them in machines. Replace worn tools, and sharpen blunt cutting tools and dies, e.g. using bench grinders or cutter-grinding machines. Maintain the lathe or turning machine. Examine quality of formed metal products to detect any defects. Report any problems to their supervisors.